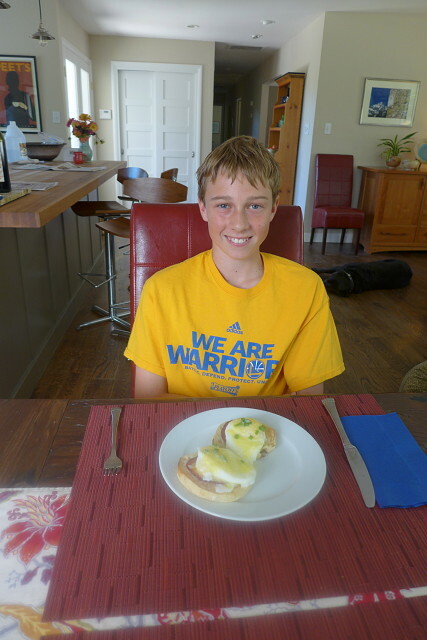 Peter elected to make Eggs Benedict from a cookbook he got for Christmas. It is a true test for a number of cooking skills and it took us two and half hours to master egg poaching 101 and semi-master hollandaise 101. We had the vortex (for poaching eggs) down to perfect timing and teamwork, but the egg never really cooked. We made a few changes in heat and mastered that. We made a perfect hollandaise which broke when we tried to keep it warm. We tried the different methods for fixing a broken sauce with mixed results. We plated and served them anyway and they tasted delicious. We may revisit Eggs Benedict when we've had time to ponder how improve the process. While we toiled over Eggs Benedict, OilMan and Dana toiled over making a new stairway to the field behind our house, out of stones from the old fireplace. It looks great. I think she enjoys the puzzle-like challenges and the physical work more than her knee does. Once finished with Eggs Benedict, Peter went to join them, adding his remarkable puzzle skills to the effort, and adding stonemason to his list of skills. OilMan and I are about to celebrate our anniversary at the Farmhouse Inn and Restaurant. It is a perfect special occasion restaurant which we've been to for Christmas Eve and on a warm summer evening with friends. We're looking forward to having a leisurely dinner, and spending the night there, so we don't have to drive the hour or so home afterwards.